IMMERSION FOR GAMING. COMFORT FOR LIVING. AUDIO GAMING FOR DAILY NEEDS. PC gamers expect high-quality, stunning, and powerful audio performance when in use. This is because today´s modern games provide exceptional design and sound effects. However, what if for other needs selailn game? 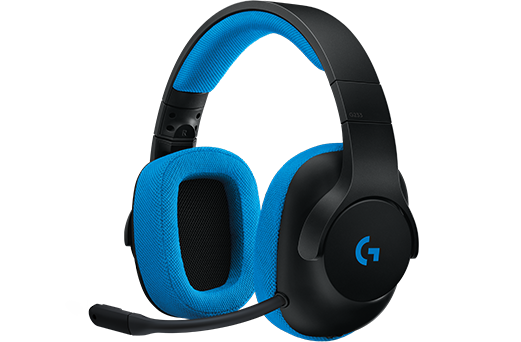 G233 is the latest type of gaming headset. You´ll get all the features and advanced technology you want for gaming in a pretty lightweight and comfortable design, which is also perfect for your everyday life. Pro-G ™ audio drivers are designed from the latest hybrid-mesh materials combined with our audio profiles to provide loud-powered bass sounds; High clear voice; Accurate treble sound; And very low level of distortion. Listen to your game clearly and clearly with realistic precision for maximum gaming. Designed for long gaming sessions, the sports-mesh ear pad will cover the ears and feel soft during use. The Pro-G ™ driver is optimized for any analog and digital audio reproduction of the audio source and keeps the best audio possible. Microphone noise-canceling boom with micro-pop filter can capture high quality voice for chat needs. G233 has a Discord certification that delivers ultra-clear communication performance. CAN BE REMOVED, CAN BE CHANGED. Audio performance adds the same cheerfulness to gaming as it does to all media. By unplugging the boom microphone and installing the gaming audio cable, the G233 Prodigy becomes a full-featured gaming headset. Remove the mic boom and replace it with the included mobile cord for G233 to work anywhere. The performance of Nintendo® Switch ™, PS4®, Xbox® One, smartphones and tablets can now be upgraded with the latest audio and G233 noise-canceling boom microphone. Use the included audio cables and attach them directly to most of the console controllers *. * Some Xbox One controllers require an Xbox One Stereo Headset adapter that is sold separately. PS4 and Xbox One only operate in stereo mode via analog cable. * Some Xbox One controllers may require an Xbox One Stereo Headset adapter, which is sold separately on PS4 and Xbox One operates in stereo mode only via analog cable.